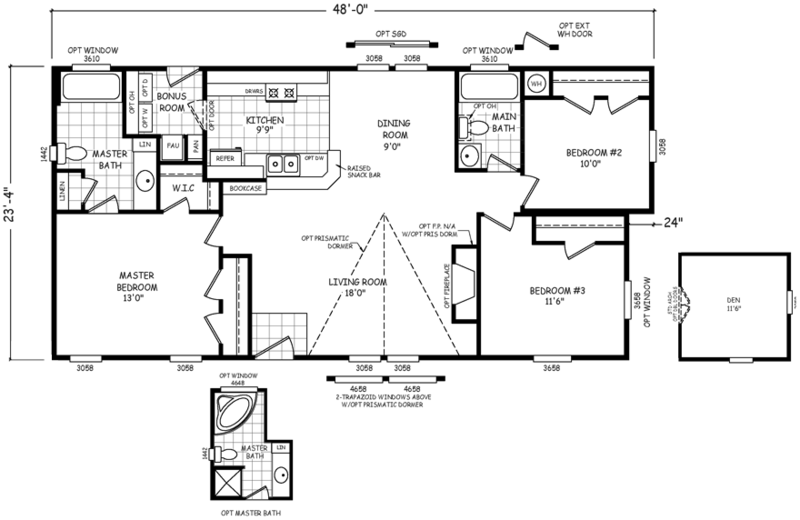 The Hillrose model has 3 Beds and 2 Baths. This 1096 square foot Double Wide home is available for delivery in Arizona, California, Nevada, New Mexico, Colorado, Utah. Filled with countless modern amenities and an affordable price tag, the Hillrose will be appreciated by all. The stylish, split floor double wide features a stunning kitchen, generously proportioned rooms and a luxurious master suite. Enhance your dream home with a den, prismatic dormer and cozy fireplace! If pictures are shown, they may depict upgrades and options that are not included within the base price of the home. Ask your housing consultant for details about the other great features that come standard on the Hillrose manufactured home.